We pass 100% of all discounts or rebates we receive directly back to you. All of our revenue is based on a set admin fee. Like any PBM, we work with manufacturers and pharmacies to secure the best pricing, rebates and discounts possible on behalf of our clients. In a traditional arrangement, the PBM may take a spread and charge the client more than the pharmacy was paid. Or, the PBM may keep some of the rebate as a way to make money. 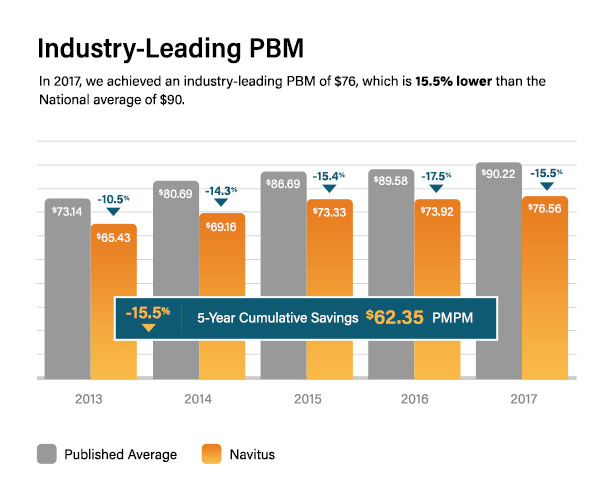 Our pass-through model is so successful that in 2017, clients that switched to Navitus from another PBM saved 17 percent, on average, in drug cost. Although these clients come from a wide range of industry sectors, by adopting our model and using recommend cost-reduction strategies, they achieved substantial PMPM trend savings. We take the unnecessary costs out of pharmacy spend to ensure our clients receive all of the savings. All discounts and rebates are returned to the client. 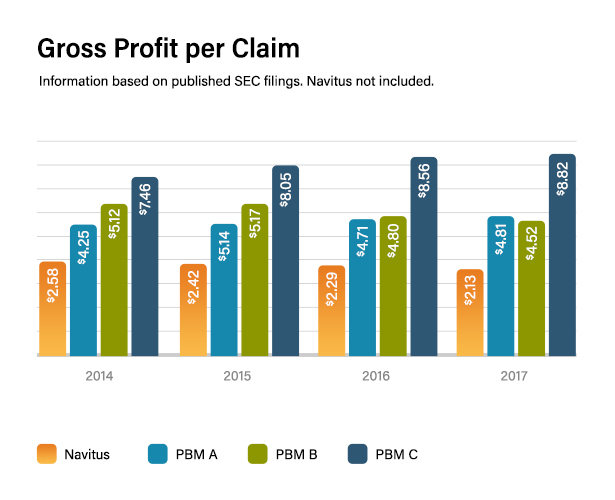 As you can see from this graph, traditional PBMs tend to keep a portion of the revenue for themselves. An agreed upon admin. fee is the only way that we earn money. 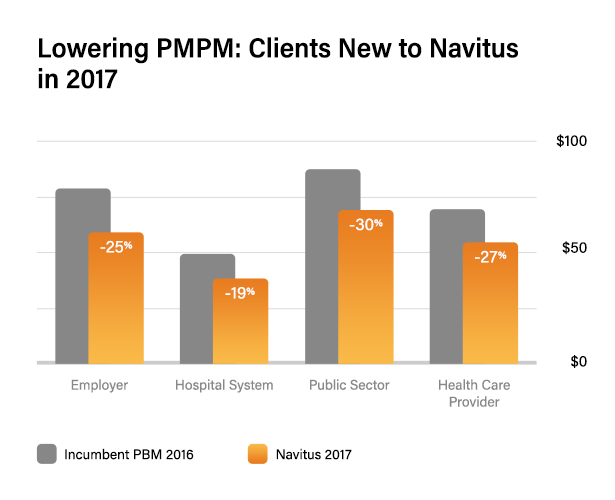 Navitus clients experience lower than average PMPM. In fact, in 2017 we helped our commercial clients achieve a PMPM of $76.56, which is 15.5 percent lower than the industry average of $90.66. But the savings aren’t limited to one year. Looking back over 5 years we held PMPM costs to a significantly lower number than the industry average, helping our clients save more. How Transparent is Your PBM? 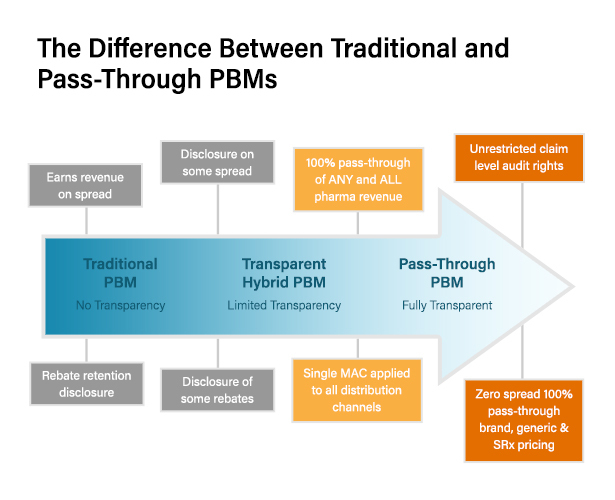 Significant differences exist between a traditional PBM and a fully transparent pass-through model. Knowing the difference can help you save on pharmacy benefits. The key is in aligning your PBM’s goals with your goals. When they align, great things can happen. Here’s a quick look at the various PBM models and how they operate. The financial savings we experienced have exceeded what we anticipated. Navitus has lived up to its promises. Why should I be concerned about spread?